South Africa tennis betting is just as popular as all the other types of sports betting. Unlike other sports including football, there are fewer factors that can influence the result of the game. The play of the game determines how the bet will be paid. There is a variety of bets available to tennis betting fans in South Africa. But before we go into the betting a little intro for South African sports gamblers unfamiliar with tennis. Tennis originated in the British city of Birmingham in the 19th century. The game can be played by individuals or teams. In the game’s modern rules a maximum of two people can play for each team. 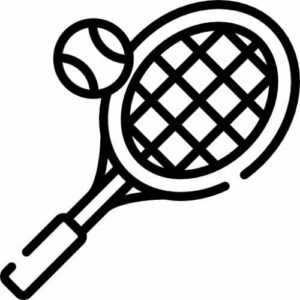 Anyone who can safely use a racquet can play the sport. Even people in wheel chairs play the sport competitively. This, plus the many types of surfaces that the game can be played on, make sure people are able to bet on tennis in South Africa all year round. We shall not go into detail about how to play the sport instead we will discuss how to make money from tennis betting. There are essentially 6 ways to bet on tennis. This is a bet that novices should start with. It is the simplest. Even without proper knowledge of the game, you can make money from the bet. This is a bet on the individual or team you think will win. When the gamblers bet on one player beating the other on a specific handicap. As the name suggests. Gamblers can take a more refined bet for more rewards by betting on the exact result of the match. This done by betting on the sets. These are your standard under or over bets. The bet is on how many matches will be played as opposed to who will win the match. As the name suggests this bet will pay for correctly picking the player who will win the first set. Just like any other form of sports betting there is a lot that affects how you choose to bet. The three key factors to consider in tennis are. A player who has not been playing for a while will not play as well as a regular player. So try not to bet on a player coming from injury or suspension. When a person has nothing to lose from losing they usually do not play well. When the stakes are higher for the player they play harder. Each player likes a certain type of court. Some prefer clay courts over grass or hard courts. When playing on the favourite type of surfaces players give better performances.